If you’re looking for something to occupy a few minutes then this interesting game from Probability Jones might fit the bill. It’s a dice game called Beat the Croupier and it’s released on Odobo’s development platform. It’s appeal is it’s simplicity so if you’ve been overwhelmed by a game such as Craps before then why not check this out? The aim of Beat The Croupier is to match the faces of the target dice by throwing your own dice before the croupier manages the same feat. It’s played on a red baize surface with the betting options to the right and spaces for the dice to the left. The first thing to do is choose your stake which you place on the ante section; you can wager £1.00 to £100. You can also place bets on a tie (4/1) or a Clean Kill (38/1)which are explained below. 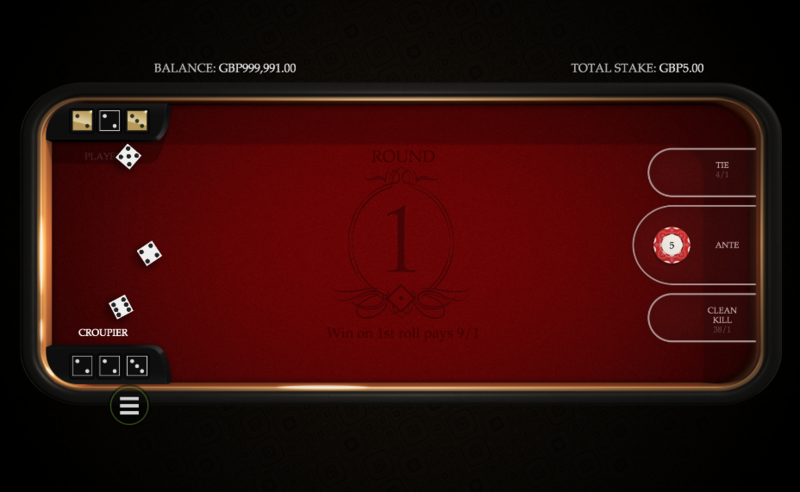 Now press the ‘Deal’ button below at the bottom of the screen and three target dice will be thrown resulting in three dice values which are shown in the ‘Player’ and ‘Croupier’ boxes. Now it’s your turn to throw three dice so do so and any matching number will be marked off on the target dice. If you match all three this is a Clean Kill and you will be paid for any bets you’ve made on that option as well as your ante win. You and the croupier both have three throws and obviously the idea is to match the numbers faster than the croupier for a win. If there’s a tie and you’ve bet on that option you will be paid for that outcome. You can also win by matching more numbers than the croupier after three throws even if you don’t match all three. Beat the Croupier is a vaguely intriguing way to waste a few minutes; it’s game of luck with virtually no strategy to speak of so no brainpower is required. It’s worth a look.